This historic 1929 building was just purchased by an LLC that tracks back to David Box, who has owned the large parking lots directly behind for a number of years. Box also purchased the Gold Dome building before flipping it to Teemco and is the majority owner of the Greens Country Club. The address is 601 & 603 NW 23rd and has been vacant and in disrepair for a while. It was home to Mutual Federal and before that Citizens State Bank but when MF moved out in the late 70's, the building has changed hands several times and has been leased to a thrift store among other things. There are actually two separate buildings that have been combined; the western section is two stories (9,172 square feet) and the eastern just one (4,845 SF). We understand the plan is to renovate for multiple tenants, including a bar & restaurant. BTW, I'm hearing that redevelopment could happen here very soon. How about a new home for Flashback! Finally. I have been curious if something was going to happen here for a while. Alright, Tower Theatre, your turn. Once The Rise is done, that will be one of the last mega-structures on 23rd to be renovated. Of course, there will be little singles along the way. Pete, is this David Box as in Box Talent? I've always liked that building. It stands a chance to be one of the most visually appealing buildings on the street. This is pure speculation, but I would be 0% surprised to find out that this will be Flashback Retro's new home. I'm told even though the roof has been badly leaking (first order of business will be to fix the roof) that the building has a lot of original art deco elements on the inside, old bank vaults, etc. Tons of potential, including a bar on the rooftop of the east building. I look at this building all the time.. when eating at Pizza23 or Orange leaf I always talk about how awesome it could be. I knew it was only a matter of time before that happened so I will be watching. you can see the tiled edge of the 2nd story "loft" through the badly discolored window in the front and I imagine the glass all clear and sparkling and able to see into the interior.. Look forward to this! I may be wrong, but believe this building originally housed the now defunct Mutual Federal Savings and Loan. One of my fave buildings on 23rd. I always thought this would be a good location for a bar like The Max in Tulsa, so I was slightly disappointed when flashback decided to locate in the rise. Hopefully this is their plan B! Drive by tonight after dinner in the area. About half a dozen guys on the roof (at 7:15pm) doing what appeared to be working on/installing a new roof. They'd been there most of the day and building was roped off as well. I'm assuming work has already started from looks of it. Do you suppose that would elicit neighborhood protests? Anyone want to take a bet as to whether this or the rise will open first? Being on the north side of the street should help. Depends. Will the future proprietors be playing Latin music? Pete - any idea if Box has any suitors for this? I was hoping Land Run would take a stab at it, but sounds like they are aiming for the dome. Maybe they will make a play for both. I think plenty of people are interested, it's just Box wants too much money for any sort of redevelopment to work. It's a cool property with tons of potential. From my understanding, LandRun had a chance to buy it but didn't. This was the location we were looking at after our deal at the rise fell through. We toured to property, had floor plans drawn out, were really excited about what we could do with the space... And then nothing. Box apparently decided he was going to hold out for something better I guess. I know the roof has been fixed and most of the inside gutted out. Hopefully someone with deep pockets can bring this place to life. Especially the space with the small glass window entry. really wish you all would have moved to this location, sounds like it wasn't your choice though. It was a cool location, but I truly believe we ended up where we should be. Uptown is really growing and they are doing great things, but the appeal of being the first bar in Film Row was something we couldn't pass up. We love the building we are in now, it has the look, the feel and layout that we wanted plus we are working with a great owner. Which building in Film Row are you going to be in? Sweet, within walking distance of me. The hits keep on coming for the booming Uptown / 23rd Street corridor, with yet another long-vacant building set for renovation and new occupants. 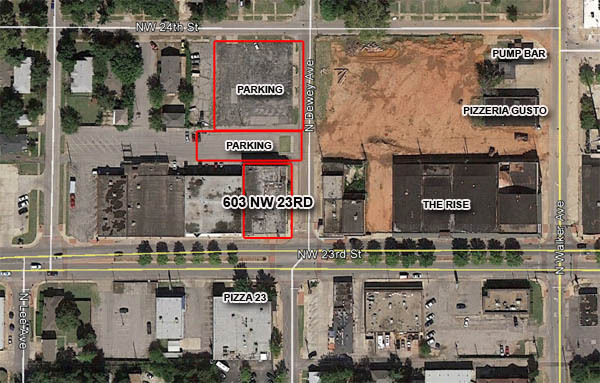 In November an LLC headed by local investor headed by Bruce Fraley purchased the buildings at 601 & 603 NW 23rd and the large parking areas to the north for $1.4 million from David Box. The structures have been vacant and in disrepair for a while. 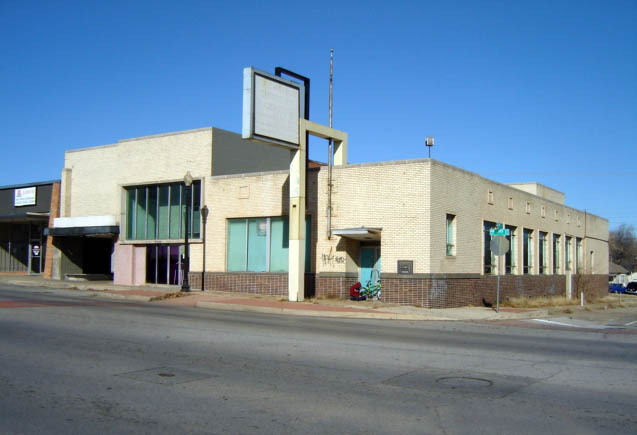 It was home to Mutual Federal and before that Citizens State Bank but when MF moved out in the late 70's, the building has changed hands several times and has been leased to a thrift store among other things. Plans call for two retail bays (one of which will retain the original bank vaults) on the ground floor and office on the second level. There is also a sizable basement. All the windows will be replaced and some new openings will be added to the northern exposure. A small amount of stucco will be removed from the front of the building and replaced with bricks to match the rest of the facade. One of the most unique features will be retained: The original storefront and window display along 23rd in the western retail bay.